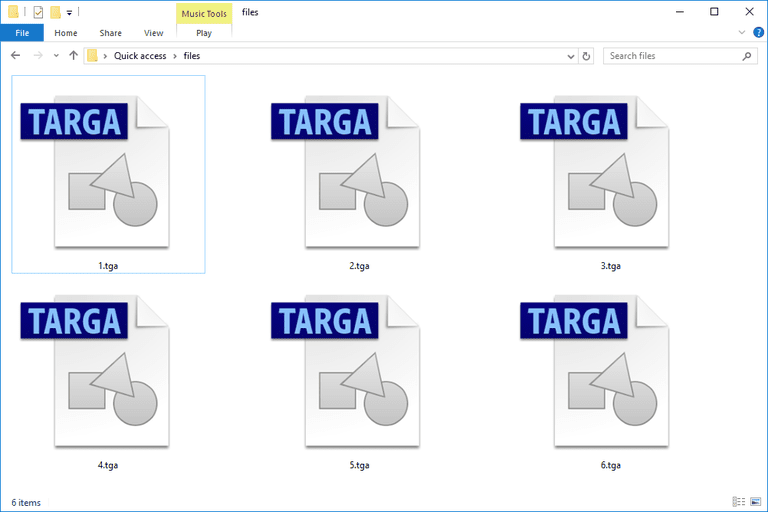 Images in the Targa Graphic format might be stored in their raw form or with compression, which might be preferred for icons, line drawings and other simple images. This format is often seen associated with image files used in video games. TGA also stands for various things that have nothing to do with the TARGA file format. For example, The Gaming Armageddon and Tandy Graphics Adapter both use the TGA abbreviation. The latter, however, is related to computer systems but not to this image format; it was a display standard for IBM video adapters that could display up to 16 colors. TGA files can be opened with Adobe Photoshop, GIMP, Paint.NET, Corel PaintShop Pro, TGA Viewer and probably some other popular photo and graphics tools as well. If you're already using one of the image viewers/editors from above, you can open the TGA file in the program and then save it to something else like JPG, PNG, or BMP. Another way to convert a TGA file is to use a free online image conversion service or offline software program. Online file converters like FileZigZag and Zamzar can convert TGA files to popular formats as well as ones like TIFF, GIF, PDF, DPX, RAS, PCX and ICO. You can convert TGA to VTF (Valve Texture), a format commonly used in video games, by importing it into VTFEdit. A TGA to DDS (DirectDraw Surface) conversion is possible with Easy2Convert TGA to DDS (tga2dds). All you have to do is load the TGA file and then pick a folder to save the DDS file in. Batch TGA to DDS conversion is supported in the professional version of the program. The Targa format was originally designed in 1984 by Truevision, which was later purchased by Pinnacle Systems in 1999. Avid Technology is now the current owner of Pinnacle Systems. AT&T EPICenter specified the TGA format at its infancy. It's first two cards, the VDA (video display adapter) and ICB (image capture board), were the first to use the format, which is why files of this type used to use the .VDA and .ICB file extensions. Some TARGA files might also end with .VST. The TARGA format can store image data in 8, 15, 16, 24 or 32 bits per pixel. If 32, 24 bits are RGB and the other 8 is for an alpha channel. A TGA file can be raw and uncompressed or it can utilize a lossless, RLE compression. This compression is great for images like icons and line drawings because they're not as complex as photographic pictures. When the TARGA format was first released, it was only used with TIPS paint software, which were two programs individually named ICB-PAINT and TARGA-PAINT. It was also used for projects pertaining to online real estate and video teleconferencing. Can You Still Not Open Your File? Some file formats use file extensions that share some of the same letters or look awfully similar. However, just because two or more file formats have similar file extensions doesn't mean that the files themselves are related at all and can open with the same programs. If your file isn't opening with any of the suggestions from above, double-check to make sure you aren't misreading the file extension. You might be confusing a TGZ or TGF (Trivial Graph Format) file with a Targa Graphic file. Another file format with similar letters belongs to the DataFlex Data file format, which uses the TAG file extension. GTA is similar but belongs to the Microsoft Groove Tool Archive file format.